"Ridge Route, the road that united California." The 5th revised edition was released on October 3rd 2015. It is a complete history of the Ridge Route from 1915 forward. Hardback, 410 pages (now with 287 pictures). For an excerpt from the book, click here. 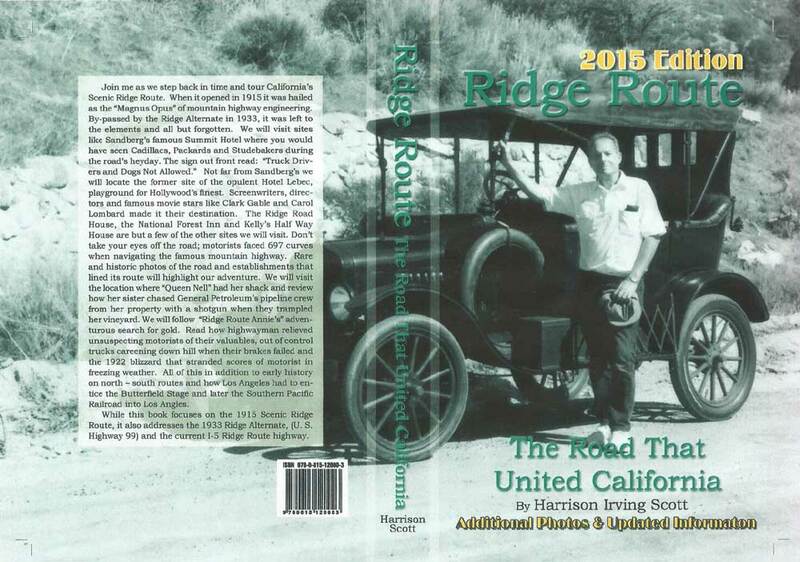 "Ridge Route, The Road That United California" is now available for online purchase. Please specify who the autograph is to be made out to before completing your order. This information should be entered in the MESSAGE TO SELLER section. This section will appear under the SHIPPING INFORMATION section on the PayPal website. Please note that PayPal indicates that this is an optional message, but if you are purchasing an autographed copy, please indicate what you would like written inside the cover. Join me as we step back in time and tour California's Scenic Ridge Route. When it opened in 1915 it was hailed as the "Magnus Opus" of mountain highway engineering. By-passed by the Ridge Alternate in 1933, it was left to the elements and all but forgotten. We will visit sites like Sanberg's famous Summit Hotel where you would have seen Cadillacs, Packards and Studebakers during the road's heyday. The sign out front read: "Truck Drivers and Dogs Not Allowed." Not far from Sandberg's we will locate the former site of the opulent Hotel Lebec, playground for Hollywood's finest. Screenwriters, directors and famous movie stars like Clark Gable and Carol Lombard made it their destination. The Ridge Road House, the National Forest Inn and Kelly's Half Way House are but a few of the other sites we will visit. Don't take your eyes off the road; motorists faced 697 curves when navigating the famous mountain highway. Rare and historic photos of the road and establishments that lined its route will highlight our adventure. We will visit the location where "Queen Nell" had her shack and review how her sister chased General Petroleum's pipeline crew from her property with a shotgun when they trampled her vineyard. We will follow "Ridge Route Annie's" adventurous search for gold. Read how highwayman relieved unsuspecting motorists of their valuables, out of control trucks careening down hill when their brakes failed and the 1922 blizzard that stranded scores of motorists in freezing weather. All of this in addition to early history on north - south routes and how Los Angeles had to entice the Butterfield Stage and later the Southern Pacific Railroad into Los Angeles. While this book focuses on the 1915 Scenic Ridge Route, it also addresses the 1933 Ridge Alternate, (U.S. Highway 99) and the current I-5 Ridge Route highway.